In 1789, during the reign of George III, an Act of Parliament legitimised the use of St. Giles as Parish Church of Pontefract. Although the church had been used in this category since the original Parish Church of All Saints in South Baileygate was virtually destroyed during the siege of the castle in 1649. Tradition says that Oswald, the first Christian King of Northumbria (633-642), caused a cross to be erected in Pontefract. This was possibly on the site of the present Buttercross that was erected in 1734. The name ‘Osgoldcross’’, depicting the division of the West Riding, was derived from this cross. The people of Tanshelf probably used the cross as a preaching station. All Saints Church in the township of Kirkby was the main point of worship during Saxon times. The present all Saints Church was built c1300. Across the road from it is the excavation that revealed an earlier Anglo-Saxon Church. A chantry chapel belonging to St John’s Priory (which was founded in 1090 by Robert de Lacy, son of Ilbert) was dedicated to the Blessed Virgin Mary and referred to at times as the Church of St Mary of Pontefract. Although the charter of 1090 lists a great deal of property belonging to the Priory there is no mention of any buildings on the ridge above the castle. It is thought that a church was built around 1106 during the period when ownership of the castle left the de Lacies and reverted to Henry I. Apparently there were two buildings on the ridge. The Chapel of St. Oswald owned by the Canons of Nostell Priory and the Chantry of the Blessed Virgin Mary that was served by the monks of the Priory of St John the Evangelist. These were incorporated into one church, the older chapel being the chancel. From 1180-1789 this building was referred to as the Chapel of St Giles. The building was officially known as St Mary de Foro (St Mary in the Marketplace). In 1181 Henry de Lacy granted a charter to the town. This charter entitled the townspeople to hold a nine-day fair, beginning on St Giles’ Day the first of September. A contemporary description of the church states that it had ‘a nave of five bays, a chancel arch and a high altar’. To the east was the chantry. The north arcade was added around 1350AD. Henry VIII split with Rome and so began the Reformation of the church. Much resentment was felt about these measures, particularly in Northern England. Catholics in Yorkshire formed the Pilgrimage of Grace with Pontefract Castle as its headquarters. The town became the focus of the upheaval. In 1535 the chantry of the Blessed Virgin Mary was suppressed. The Chantry priest, Roger Frykleys, was awarded a pension of £5 per annum. The chantry chapel was incorporated into the main building of the church. The Civil War took place from (1641-1651). March 1649 marked the end of the third siege. Close to where Halfpenny Lane meets Front Street stood a building belonging to the Church of England. Built of stone, close to the top of the frontage was a plaque inscribed to ‘Mary Hudson – daughter of the late John Fothergill Esq. of Kingthorp in this county’. (Mary was the daughter of Colonel Fothergill of Kingthorp in Yorkshire. She married John Conyers Hudson of Helmsley who was employed as a clerk at East India House. He was involved in Anglican Church life). This was known as St. Mary’s Mission and, built in 1851, was used as a Sunday School. In 1915 the building was used as an Infants’ School until a new school was built near the railway line. That school was demolished in the early 1990’s and a new Railway Station built. In 1924 the organ was removed and given to the new Parish of Airedale. It was used in the temporary building (the hut which was previously the Mission Church in Wheldon Road). The organ now used in Holy Cross Church was installed in 1984 when it was removed from the Methodist Church in Gipton, Leeds. The Methodist Church was demolished. In 1952, Norman Atkinson, with his sons, moved into this building and used it for a printing business. There were two rooms some of the pews were re-used as shelves. Opposite, in the former quarry that was originally a marl pit, holes and niches indicate the presence of former houses from the C19. Next to the quarry were the public swimming baths. They were closed in 1914. 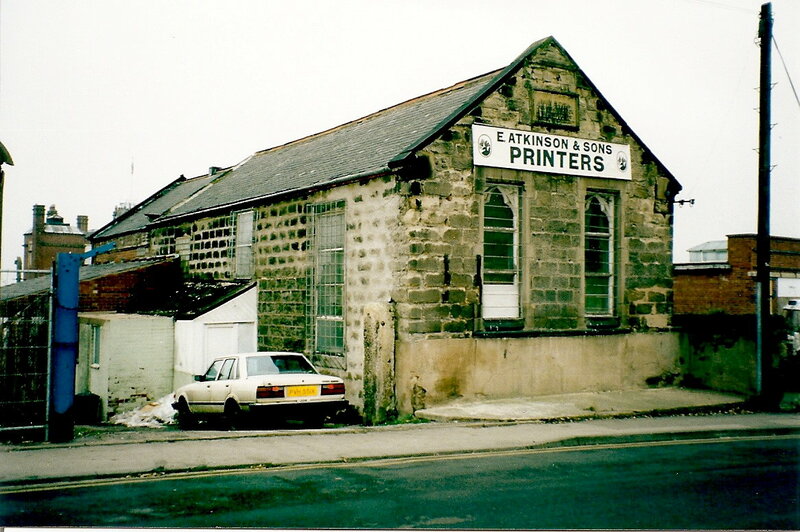 St Mary’s Mission was demolished in 2001 and Harratts Garage built in its place. Atkinson’s new premises are in the Britannia Works on Skinner Lane. Has anyone more info on St. Mary`s. Are there any record books giving details of caretakers or Sunday School records. My mother and siblings attended the Sunday school and church services in the 1920`s. Her parents were the caretakers at the time. Sorry, I have put all I know on the website.